These design portfolio best practices are the combined voice of 20+ creative directors, art directors, marketing managers, editors, agents etc. People who repeatedly buy services of freelance graphic designers, illustrators, and web designers. 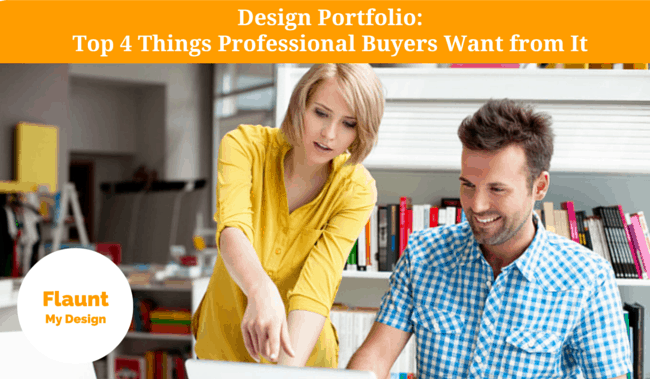 If you want professional design buyers to LOVE your online design portfolio let these 4 factors guide you. Pick only pieces that showcase your USP, e.g. a signature style. Pick only the pieces that stand out/feels different in your chosen categories. Scrap the rest. Resist the temptation to bulk out your design portfolio with old, irrelevant or less than top-notch samples of your work. Start with the best of the best. Finish with your second best. In between a few more solid examples. Don’t show more than one or two examples of the same sort of work, e.g. only one or two banners for cell phone plans even if you have done dozens. Show your work in totality first. That means show the whole thing – ideally at full resolution. Details matter to professional buyers. Show current work – ideally from the past year. Max 5 years old. Exception: If you were the originator of a high-profile, universally admired campaign. Professional buyers are looking for practical skills for real, client-driven everyday design work. Don't show too much school work. If you don't have enough pieces self-initiate something. Remake something to show your passions and skills, but not book covers or posters… Anyone can make those look good. Re-brand a famous brand or a well-known piece of advertising. It's all about the context, and showing your designs as they were intended to be seen. Don’t show work out of context, e.g. on a cool, but unnatural angle. Take photos of printed material. Professional buyers often review tens if not hundreds of design portfolios every week. Make them happy by focusing your portfolio site on your best work, grouping work that is associated together, making the portfolio easy to navigate and the images quick to load. First show the work in its totality. Put it on the landing page. Help design buyers to review your portfolio faster by categorizing your work properly! If you work in two or three different styles or have different skills, i.e. web design and illustration, strongly consider having separate portfolios for each. Ability to explain your work impresses: Inspirations, skills used, the thinking behind it etc. Provide context, but keep it short. Make sure to show what extra value you added. Tell how you took the initiative. This is not the time to be humble. Keep the presentation dead simple. 3. Show Yourself. Your Passions. Your Thinking. A potential client needs to like and trust you. Give them a glimpse of who you are: Your personality, your aspirations, your thinking, inspirations, passions, interests, and skills. Remember, a design portfolio is your branding and marketing tool! Pick pieces that clearly reflect what you want to be known for and the type of jobs you want. Build your portfolio with the work you want to do in the future. Your portfolio is not what you did, but what you’re going to do next. Be present in the flesh. As a bare minimum, publish a photo of yourself on the About page. Let them glimpse the person behind the work. Show your personality, passions and interests through the pieces you pick and accompanying notes. Again, this is not the time to be humble. Describe your skills with confidence. Only show your absolute best work! Scrap the rest. Flawless navigation and categorization! Help them review your portfolio super fast! Show yourself! Express your passions! Help them like and trust you. Did you like this? Sign up for blog updates! I have decided to put a portfolio together regarding my business so I started looking online on how to start one, everything I have read has been very helpful. Glad I could help, Zahra! Good luck with your portfolio! The advice here is pretty helpful. I have a better idea of how to begin my portfolio. Thank you!